Chills ran up my spine. Goosebumps formed on my arms. Minor tears in the back of my eyes wanted to come forward. My eyes fixated on the screen until the end. 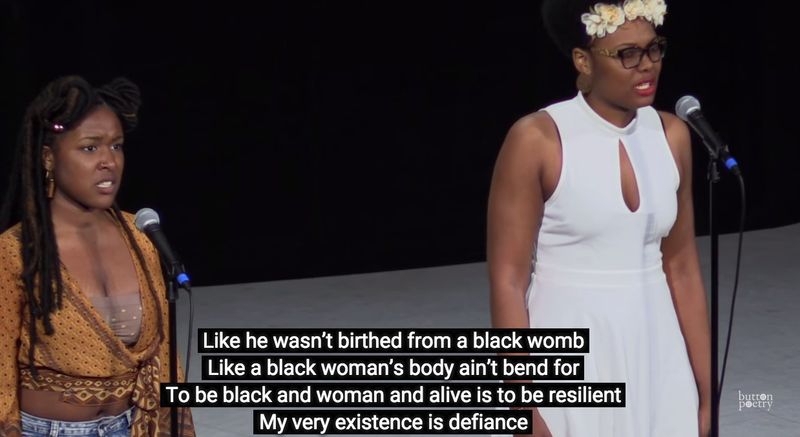 I felt all of this as I watched poets Crystal Valentine and Aaliyah Jihad perform their stirringly honest poem “To Be Black And Woman and Alive.” It was recently selected as a part of the 2015 College Unions Poetry Slam Invitational finals back in April. Poetry collective Button Poetry posted the video of their set earlier this week. “To Be Black And Woman and Alive” is strong, confrontational and simultaneously rooted in sadness and courage. The two eloquently called out the Black men that have slandered Black women in order to justify their interracial dating and how odd it is that such behavior is exhibited though having been birthed by Black women and raised along Black sisters. They also remarked on how the patriarchal system within the Black society advertises that idea that Black is beautiful only when mixed with something else racially (and occasionally culturally). Black women, despite these hurdles, have taught themselves for decades to stand up straight in the winds of adversity. Beyond a fact. As much as I supported the beginning stages of the Black Lives Matter movement, which rose out of the deaths of unarmed Black men mostly, I consistently wondered if Black men would march in the streets for my sisters if we were gunned down at as high of a rate. I couldn’t help but think sometimes, no but I sometimes pushed aside my pessimism and prayed for the families who lost loved ones. Currently in the news, the mysterious and shocking death of Sandra Bland, a Black woman in Texas, who was found dead in her Waller County Jail in Houston. She taken in after a “routine traffic stop” but videos and mounting stories are demanding answers to why she was taken in the first place and if she was already dead by the time her mugshot was photographed. It’s a scary developing story and Bland is becoming the de facto female face and body of the Black women in Black Lives Matter.